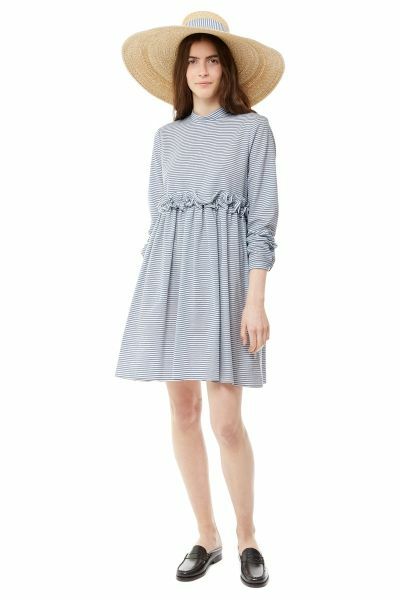 The Guilia Dress in little denim & white stripe is charming. She has wonderful ruffles at her waist, gathered to perfection to look like strings of petals. A small stand collar fastens at the back with a single Cabbages & Roses engraved button. Full length sleeves finish at a simple button fastening cuff. Guilia has a gathered skirt with handy side seam pockets. Fitted to the bust and with fitted sleeves, she flows out at the waist with a dramatic skirt. The best dress you will own. Guilia is unlined. The Guilia Dress is made from a little denim & white striped cotton woven in Italy. Guilia was made in Hertfordshire. 100% Cotton. Caring for your Dress. Guilia can be machine washed at 30°, we recommend using Ecover Delicate Laundry Liquid. Can be dry cleaned, if you must, with an ecologically friendly dry cleaner. Press with a warm iron. Please do not bleach or tumble dry Guilia.